Looking for a USED R-CNC80? Another popular machine from the Baileigh Industrial Family is our new R-CNC80 machine. With enough power to handle up to 2.5” Schedule 40 Pipe this monster of a machine is nothing to take lightly. Together with cutting edge CNC technology and industry leading quality the R-CNC80 machine can bend a vast variety of profiles and/or complex extrusions. The X axis encoder makes it possible for the user to program a desired material length and the machine will automatically fed to that appropriate distance which will come in handy for production run parts. The X Axis works simultaneously with the Y axis to provide smooth transitions between bends while giving the operator the option to attach and save part numbers for each of the bend programs. 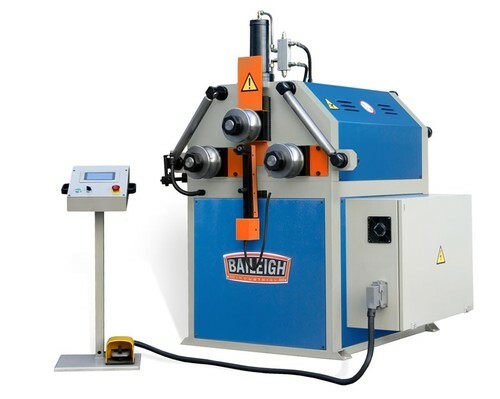 Looking to Purchase a New BAILEIGH R-CNC80?